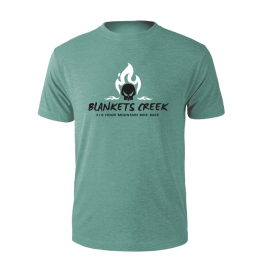 2019 Blankets Creek 3 and 6 Hour Mountain Bike Race - Coming October 12, 2019 - presented by Van Michael Men! Early Check-in and Registration at OutSpokin' Bicycles on Sixes Road from 4 pm to 7 pm. All 6 Hour Cateogories race for Medals and Prizes except 3 person Just Having Fun and 3 person Junior divisions, who race for medals only. 6 Hour Solo Expert and 6 Hour 2 Person Expert divisions race for cash payout. All 3 Hour divisions race for medals. Solo 3 Hour Expert divisions race for medals and prizes. Commemorative beverage glass for the first 200 who register! 2018 T-Shirt Design - we like the flaming skull so expect a similar design for 2019. Shirts will be cotton/poly blend tees with race logo and are super lightweight and comfy. Register by September 28th to guarantee one of these great shirts in your preferred size. If you register after the 28th, sizes are first-come, first-serve as you REGISTER (meaning if a size is available when you register and pay, that is what you will get on race day). Only sizes/styles still available will be shown in the shirt selection menu when you register. Those who register late or on race day will likely receive a Mountain Goat Logo shirt if we run out of event specific shirts. How Does This Event Actually Work? All solo racers and teams pitting with solo racers are welcome to set up a pit area/tent along the portion of the course that will run through the main parking lot at Blankets Creek. We will utilize the shaded, grassy area between the parking lot and River Church as our team pit area. We will have an on-the-bike start where riders will complete a half mile parade lap before heading into the trail and starting their first lap. Once you complete your lap, as you come back into the parking lot, you will need to dismount your bike and run with it through the timing and teammate exchange area. If you are on a team, this is where you will tag your teammate and the next rider will run his bike out of the exchange area and then remount and take off on their lap. Solos just keep running through the exchange area (don't worry, it won't be very far) and then remount after exiting. After going through the exchange area, teams and solos are welcome to stop at their pit area along the course to refuel, switch bikes, fix bikes, sit and rest, etc., before heading out for their lap. Most riders on teams won't need to stop (since they will have just started), but solos will likely need to refuel at some point. This year we are instituting a firm 4 pm cutoff for the 6 Hour Race and 1:15 pm cutoff for the 3 Hour Race, meaning that if you don't return by those times, your last lap does not count. This will allow the racer to make the call as to whether to try to squeeze in another lap or just pack it in for the day. This is to ensure that we can have the awards ceremony in a timely manner. Solos only need to complete one lap to be considered an official finisher, however the winner will be determined by who has the most number of laps in the least amount of time. Mountain Goat Adventures utilizes Chip Timing using MyLaps Bibtag Technology and our Real Time Results System. Lap times will be visible in real-time from our results kiosk as well as via your wireless device. Instant gratification! Please note this is probably not a comprehensive list..but it may answer some of your questions. Outside (non racer) assistance is only permitted in the pit area. Non racers may not assist out on the course. Racers may assist other racers and are encouraged to do so. You must run or walk your bike into and out of the exchange/timing area each lap, regardless of whether you are a team or solo racer. Due to the number of racers on the trail, headphones/ipods are strongly discouraged. Race numbers must be visible at all times and must be mounted to the handlebars on the front of the bike. Cutting the course is not permitted. Penalty is DQ and public ridicule. In the event of an unfixable mechanical, the racer must complete the lap along the entire course with his/her bike to receive credit for the lap. You MAY back track or shortcut back to the pit to fix your bike, but you will not receive credit for that lap. Do not enter the timing/exchange area if you are coming back from an incomplete lap. Please be honest. Please exercise caution and good sportsmanship when passing other racers on the trail. Announce your intention to pass rather than just forcing your way by with no warning. Most riders will gladly let you pass. Once you reach your pit, you may change any equipment you want, including bikes, and you may stay there as long as you'd like. Parking will be in the Blankets Creek Parking Lot and Cherokee Charter Academy, which is just east of Blankets Creek on Sixes Road. Parking is first come, first served. If you arrive late, be prepared to park at Cherokee Charter and take the sidewalk over to Blankets Creek. Medals and Cash Payout to 6 Hour Solo Expert Male/Female, 6 Hour 2 Person Expert Male/Female, and 3 Hour Solo Expert classes. Medals and prizes to all 6 Hour solo and 2 Person teams, as well as 3 Person Male/Female/Coed. Medals only to 3 Person Just Having Fun and 3 Person Junior teams, as well as medals only for all non-expert 3 hour categories. We also have created custom podium t-shirts that all of our first place 6 Hour Category winners will receive (solo and teams). You'll want one, so start training now! You must be present at the awards ceremony to receive your award. Awards and prizes will not be mailed. If you win something and bail on the awards ceremony, your prize will be added to the raffle goodies pile or given to a race volunteer.